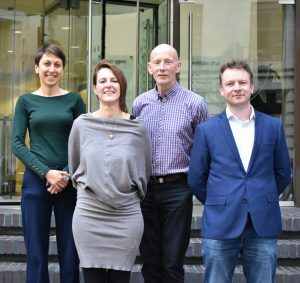 October 23, 2018 – European online parking reservation leader, ParkCloud, is pleased to announce the appointment of four new directors as it enters a new phase of expansion. Following the announcement of its new ownership structure earlier this year, Managing Director, Mark Pegler, has formed a newly appointed senior management team to focus top line development into strategic areas of the business. Dr Valentina Moise has been promoted from General Manager to Commercial Director, having been a key figure within the business for the past seven years and instrumental in spearheading growth within a number of international markets. Valentina will now oversee all aspects of ParkCloud’s top line business operations and international engagements. With overarching responsibility of the company’s financial structure, Joanna Cherry – former Finance Director of online travel retailer, On the Beach Group PLC – will lead ParkCloud’s accounts team to bring additional fluidity to the business’ finance systems and processes. Industry veteran, Gary Pyatt, joins the ParkCloud team in the new role of Sales Director, having led senior positions at companies such as ADVAM and AeroParker. Utilising his sector experience, Gary will work collectively with ParkCloud’s sales and partnership teams to establish new revenue streams and further enhance the collaborations the business currently holds. Completing the senior team, Phil Windas, formerly of We Buy Any Car and more recently Help-Link, joins ParkCloud as the newly appointed Marketing Director. With a wealth of experience in advising at Board level, Phil will engage his skills within online marketing to grow ParkCloud’s digital presence and further accelerate conversion rates. “As we enter a new and exciting stage of ParkCloud’s commercial development, it’s vital that we garner the most strategic impact from the core areas of our business. To find out more about ParkCloud, please visit the website.